Check integrity of library databases. Question/Topic: How to check the integrity of library databases (inventory audit, library maintenance)? 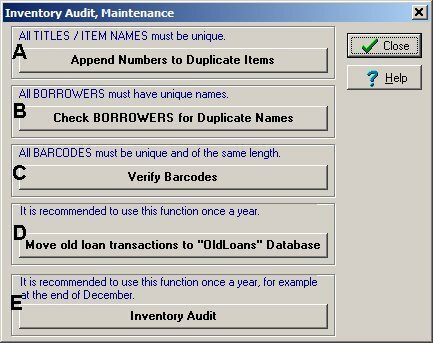 Library Inventory Audit, Library Maintenance commands allow you to check the integrity of your library databases. If you process check out and check in transactions manually (items and borrowers are selected from the drop down list) then you do not have to run barcode maintenance commands. A) Append Numbers to Duplicate Items: To process check in/out transaction you are not allowed to have two items with the same title. Use this command to find and modify all duplicate items. B) Check Borrowers for Duplicate Names: To process check in/out transaction you are not allowed to have two borrowers with the same name. Use this command to find and modify all duplicate names. 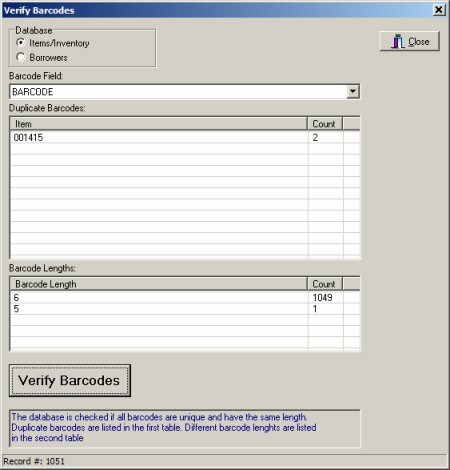 C) Verify Barcodes: To process check in/out transaction with a barcode scanner you are not allowed to have duplicate barcode values (also your barcodes should have the same length, for example 00123, 0123 are unique values but 0123 is included in the 00123). Use this command to analyze all your barcodes. D) Move old loan transaction to "OldLoans" Database: Check in/out transactions are automatically stored in the Loan database. Once a year move old loan/return transaction to another database. 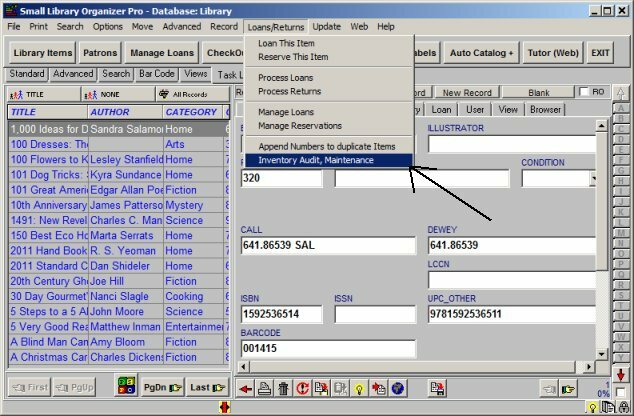 E) Library Inventory Audit: Inventory Audit allows you to check your physical inventory. Once a year you can use Inventory Audit feature to physically check your inventory against what you have listed in the software. Select Title field in the Item Name or Title Field box. Duplicate items are listed in the Duplicate Items table. Verify the text that will be inserted before the number (default text: " - "). 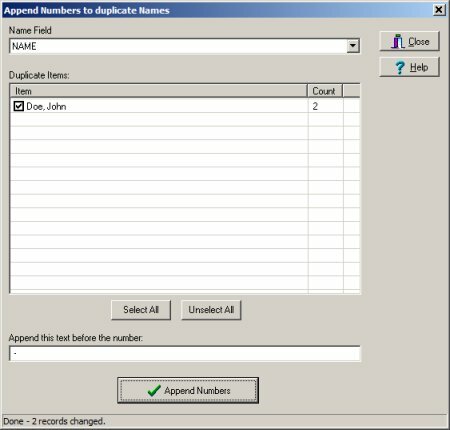 Click Append Numbers button to modify all duplicate items. Select Borrower Name field in the Name Field box. Duplicate borrowers are listed in the Duplicate Items table. Click Append Numbers button to modify all duplicate borrower names. Select Items/Inventory or Borrowers database. Click Verify Barcodes to verify. 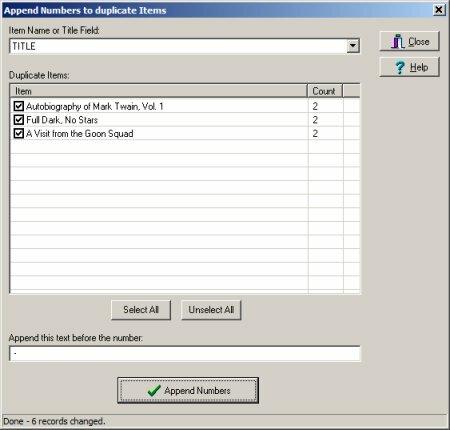 Duplicate barcode values are listed in the Duplicate Barcodes table. Barcode Lengths are listed in the Barcode Lengths table. Click Move Old Transactions button. The program will move all check in/out transaction from prior years to OldLoans database. How to process library inventory audit?